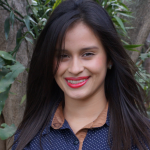 Stefany is originally from the community Chuscaj in the municipality of Chiantla, Huehuetenango. She was selected as a GOJoven Guatemala Fellow when she was 19 years old. She is an extroverted, dynamic woman and youth leader in her community, thanks to her participation in the organization, New Earth. Stefany is committed to disseminating the information she has learned through her community and work experiences, since her goal is to guide, support and motivate groups of young people outside of school who lack accessibility to information on sexual and reproductive health and rights issues. She has started working as a health promoter of these topics by supporting the facilitation of workshops in the different communities in Chiantla. She is in her first year of studying for her degree in Social Work at San Carlos University, which motivates her everyday to keep up her knowledge up to date in order to better support the vulnerable and excluded population in her community.